6 Summer Reading Books for Watercolor Nerds! 2) Joseph Zbukvic's "Mastering Atmosphere and Mood in Watercolor"
3) James Gurney's "Color and Light: A Guide for the Realist Painter"
Hawthorne on Painting is the easiest and most "inspiring" read of the bunch. It's short (less than 100 pages), cheap, and full of really loose, conversational excerpts and quotes from lectures he gave while teaching plein air watercolor and acrylics in the early 1900's. It's worth noting that although I like some of Hawthorne's work, he's by far not a favorite of mine. He also is primarily an acrylic painter. Even so, I liked the book's breezy tone, and how it focused more on seeing the world, how to view things and compose a striking image, how to think as an artist sharing an emotion and mood, and less on specific techniques. I carried a pencil with me while I read it and marked and highlighted many things. He has the cadence and clear vocabulary of a seasoned teacher who knows what he thinks, and has learned to share it succinctly. That clarity helps to carry his opinions across the medium to watercolors (which he also talks about specifically, as well-- just less). Of the 4 new books, its by far the one I'll be most likely to reread and browse through. It's the sort of book you'll find a quote from that you'll carry with you for a long while (as well as a few you'll completely disagree with!). I guess earlier copies of the book had full color pictures that went with the excerpts-- that sounds wonderful, honestly, and with they were here, but 7$, it's hard to fault the book for what it so readily and eloquently provides. 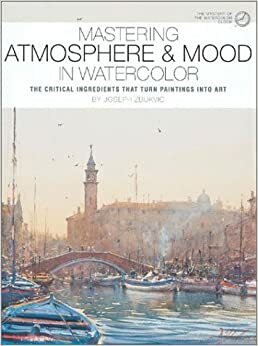 Zbukvic's Mastering Atmosphere and Mood in Watercolor is a book I long wanted to read, but I never had the 300$ to purchase a used copy of the out-of-print book off of Amazon. Then I asked for an interlibrary loan, and voila! I got the opportunity. Then I read and re-read it. :) It's worth being upfront and making it clear that Zbukvic is easily one of my favorite living painters. So it was a book I was interested in reading because I love the work he produces. Compared to Hawthorne on Painting, this one is all about technique and composition, but was well worth it, IMO. Zbukvic spends a lot of time setting up and explaining his "Watercolor Clock", a really marvelous visual teaching too, and then, using it, discusses the affects and interactions of various ratios of water and pigment. How wet is the paper? How much pigment do you have on the brush? How wet is your brush? All this is very central to the best parts of the book. He also talks about the value of having a "Mother Color" and how this guides his color choices. I've actually written up a far more detailed post on the book, which I took from the notes I wrote and typed up while reading it. So, hopefully, I'll be sharing that at a later point, but at the very least, this is a book well worth reading on your own, if you can get your hands on it. Gurney's "Color and Light" is a book I actually read a year or two ago, but it's such a great, functional, useful read, and so essential, IMO, to understanding... well... light and color, that I had to put it in this list. If I was going to buy one book on painting realistically, this is the one I'd get. It's cheap, its full of full color pics, the chapters are short, topical, and to the point with useful info. It's got a hands on approach to what it offers-- it's not about theory, it's about how the world looks when you view it, why things work they way they do scientifically, and how you can reproduce those kinds of results if you want to. It changed the way I viewed many things, which is a great gift in and of itself, but it also helped me acquire a kind of short hand for how to view and compose things for my paintings. Some stuff that it points out about how light and color work seems so obvious and straightforward now that I've read the book, but beforehand, I never would have noticed so many beautiful and interesting details that, when selectively brought into a painting, give a work a compelling veracity. Well, well worth the read. Mitchell's Landscape Painting- Essential Concepts and Techniques was a book that had come highly recommended, but I found a bit underwhelming, personally. Perhaps I was looking for something other than it offered, or perhaps it was how it was basically focused on acrylics and oils. Perhaps it was because I had already read things like Gurney's" Color and Light", and they shared similar info. Who knows? Either way, I got it for free from the library and browsed and read it over for a number of weeks. It was fine reading, and perhaps very good reading for acrylic and oil painters, but I think watercolorists would be better served by reading Zbukvic's book in combination with Gurney's. For free though, it was a fine way to spend some time, and many of the images are beautiful. 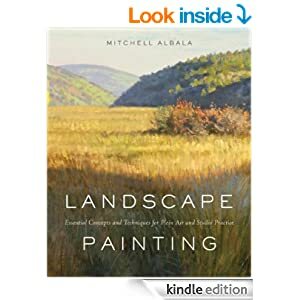 Carlson's Guide to Landscape Painting is supposedly what Mitchell's Landscape Painting book is based on/ was used for inspiration/ was influenced by/ was updating. Needless to say, the two share a lot of similar info. Mitchell's is just more modern and has full color pictures. Carlson's is all black and white reproductions of art. It's supposedly to help you pay attention to value more, and it does that, but it also feels cheap. There's some good stuff in there, if you can wade through the verbage, just as there is in Mitchell's book. Some useful, direct info about understanding color and distance, skies, clouds, etc. That sort of stuff. The problem is that the book was written around 100 years ago, so the language can be dense and slow. Throw in the fact that all the images are black and white (even when he's talking about color, and not value), and you've got what can be a (useful) challenge. The book is available in paperback, and so it's cheap on Amazon. For the 10$, it was worth it to me. For free, from a library, I'd browse a copy at the very least, along with Mitchell's more expensive hardcover, to help you decide if you'd like to take it home with you. And, for a sense of completion, Ron Ranson's On Skies. I'm not a big fan of Ron Ranson's work, per se, but I ran into this book for free a year or two ago and so I read it. If you can get a free copy and are curious about clouds and skies (and certain loose watercolor techniques for how you might paint them), I think it's worth your time. It's full of lots of illustrations, which is helpful, and at the time I read it, any help painting was good help. It's not the best book on painting I've read-- in fact, it's super focused in it's subject matter-- but I love clouds, and it was interesting and helpful to read and learn about them, how they form and behave, and some of his wet into wet techniques for painting them.